Bristol Airport reopened at 4.30pm this afternoon after heavy snow overnight and this morning forced it to cancel more than 100 flights. The snow around Bristol and across the West of England brought chaos to the region’s roads. With commuters struggling to get to work, many businesses urged staff to work from home rather than venture out. Some 130 flights scheduled for today were disrupted at Bristol Airport with some diverted to other airports as workers attempted to clear the runway. 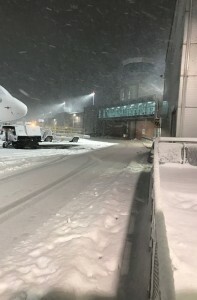 Airport bosses earlier said it would remain closed until at least midday but more snow prevented it reopening. The airport expects to operate its full flight schedule tomorrow. Flights to Brussels, Frankfurt, Paris, Vienna, Barcelona and Glasgow were among those cancelled this morning while a KLM Amsterdam flight was routed via Cardiff. Bristol’s main roads had been gritted overnight and First Bus said the majority of its services were running as normal. Metrobus services are operating as normal.